The cdbForm_dsflist class which is short for "databound form with a dynamic sizing floating list", can be regarded as an IDE-compatible AUTOCOMPLETE solution. After placing the object on your view, select the file.field you wish to data to be connected to. You may choose a separate file.field for data to be displayed from by setting the Alt_Data_File and Alt_Data_Field. You must set the Float_Index to the index you wish the searching to be performed on. This index needs to be a unique index for the data being displayed otherwise you will have the data repeated many times. I don't recommend you use this on a field for a last name because you when the user types "SMITH", all they will see is a list containing only "SMITH" and will never see "SMITHERS" until they type the "E". If the data is coming from the same file (i.e. you didn't set the Alt_Data_File) then you can set the Float_Find to TRUE. This option will allow the record you just selected to become the current record. This action is simular to that of the selectionlist class, just a bit faster for data entry. Let's say you want to use the Float_Find in an Invoice# field. You want to help the user by showing all possible invoices matching what they entered. In this case, it would help to show the find results in descending order. This can be done by setting the Find_Dir to DF_DESCENDING. You can control the number of finds done by setting the Max_Finds. This is beneficial when working with large files where a single key press could slow down the system if you find every record starting with the entered character. I recommend you set the limit to 10. After the first 10 matching records have been found, it jumps out of the find loop, even in descending order. Have a datafile for Cities. As the user types, they can select a City from the list. Modify your save routine to check if the city exists and add it if not. 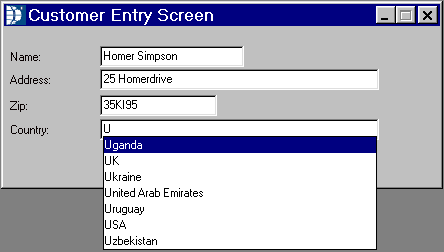 Then a simple entry screen for the users to edit any cities that maybe in the list to remove misspellings or duplicates (i.e. Clinton Township, Clinton Twp).